Curry Lover's Cookbook written by a prolific Indian food writer based in United Kingdom, Mridula Baljekar. She has written is more than two dozens books on Indian and South East Asian cuisine. 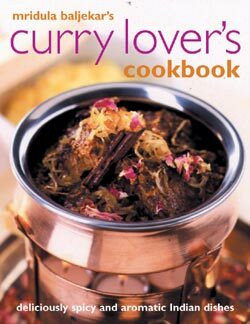 The Curry Lover's is an updated edition of the 2003 book by this award-winning and best-selling author. The book begins with introductory section with topics on principle of Indian cooking, guide to traditional Indian ingredients, utensils, Indian food culture, and other Indian food related topics. The recipes are divided into majorly with regions with a section followed by common Indian food categories such as rice and bread etc. This book, in a way, functions as a complete introductory manual to the Indian food. The glossy pages with her step-by-step illustrative guides on techniques of the recipes are could be of tremendously resource to many budding curry chefs. Baljekar provides recipes of many Indian dishes that one may encounter at many Indian restaurants such as such as Samosas, Rogan Josh, Chicken Tikka Masala. The directions are clear and detailed, yet easy enough to follow smoothly. By giving recipes for many popular dishes, it seems that she is encouraging many Indian food enthusiasts who have ate but never made theses classic dishes by themselves. In addition to these well known recipes, she also gives many authentic Indian recipes that may be new to many such as Dhansak, a Persian Gujrati vegetable dish, and Tok, a traditional ginger pineapple side Bengali dish. For my part of hands on review, I loaned the book to my sister, a budding Indian food cook at best. She fascinated with all the appealing Indian food photos in the book and after much deliberation settled on making king prawn curry. According to the author, this shrimp dish is inspired by Bengali Malai Chingri, which roughly translates to butter shrimp. After careful study of recipe and mad dash to store to get paprika, my sister finally finished the dish. The resulting shrimp dish (see the image on the page) was aromatic and flavorful. Needless to say it was first thing gone on the table. Curry Lover's Cookbook serve as excellent introductory cookbook to Indian curry cooking. Mirdula Baljekar's other best selling books include the Low Fat Indian Vegetarian Cooking, Fat Free Indian Cooking and Real Fast Indian Food. 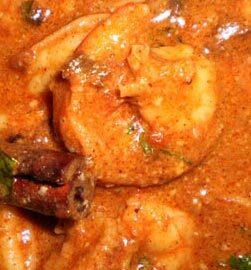 Also watch out for her new book " Regional Cooking of India: 80 recipes shown in 300 exquisite photographs"
Image: King Prawn Curry. Copyright 2009.